Anyone from James Bond to Dracula would be very pleased to wear this beautiful ring. Our sleek black steel makes an elegant backdrop for the gleaming CZ stone centerpiece which really makes this ring shine. 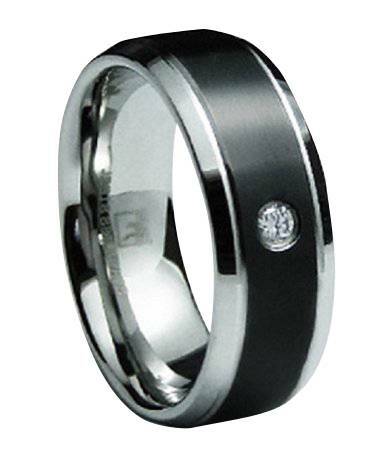 This is a handsome ring that brings a stylish element to any ensemble. It's dark and broody, but with a silver lining (literally).Note: Comfort Rings are usually 1/2 size smaller. We recommend having your finger measured for a comfort fit ring at your local jewelry store first to ensure the correct fit. This ring actually fit him! I have searched and bought from so many different site and none of them fit.. finally I have found a site that is true to their sizes and word. 1st try was perfect. and the quality of the ring couldn't be any better.. thank you! This ring is fabulous! I honestly could not believe how nice it is and how classy it looks considering the extremely low price. I highly recommend it! Ring fits good, looks great. Only issue is I work with my hands, that black scratches away. But if your not rough on rings it would be great. We ordered a size 13 and it fit him perfectly, he wears a 13.5 to a 14 Standard size and we knew comfort fit would fit a bit snug, and a 13 was perfect!